We report the history of two brothers who had early onset Parkinson (EOP) with blepharospasm, with family a history of Parkinson's disease. In both the neuropsychological examination showed cognitive deterioration with frontal lobe dysfunction. Patients with PLA2G6 mutation could show heterogeneous phenotype such as dystonia-parkinsonism (dystonia at onset affecting 14–57% of EOP patients and off period dystonia as affecting 30–59%), dementia and frontotemporal atrophy. Conclusion: In some genetic types of PD is produced from the beginning a degeneration of multiple systems with deficit in multiple neurotransmitters. Parkinson's disease (PD) was described for first time in 1817 by James Parkinson. In 1888 Gowers introduces the possibility of a hereditary disease. 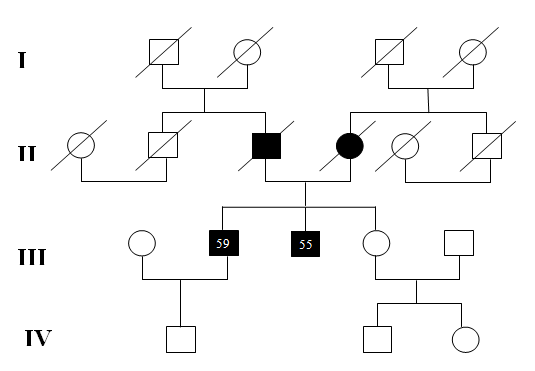 Subsequently the studies of cases-controls have made it possible to identify a history of Parkinson family between 13% and 33% of the cases,1–8 what presumes that the relatives of patients with PD have a risk between 3.5 and 14.6 times greater than the relatives of the controls in order to develop the disease.2 The heredity pattern of many of these cases is compatible with a dominant autosomal heredity with reduced penetrance, being the maximum risk of developing the disease of 20% for the relatives of first degree.8 Some studies have in addition demonstrated the existence of a genetic anticipation; however, have not been able to be identified differentiating clinical features among the family cases and the sporadic in the majority of studies, except for a trend an earlier beginning of the disease in the family cases in one of these studies.3 Some types of PD with a demonstrated genetic pattern have a beginning which is early and/or associated with other movement disorders, basically dystonia.6 Our objective is to show the case of two brothers had an early onset Parkinson's disease as blepharospasm. We report the history of two male patients, brothers who had early onset Parkinson Disease (EOP) with blepharospasm and tremor of the right arm, with family history of Parkinson's disease: father and mother, which initiated and maintained their evolution with predominance of tremor. The younger brother (YB) is 55 years old, rural origin, healthy history, begins at 47 years old with involuntary movements in both eyes (blepharospasm) and approximately 8 months later begins with tremor in the right upper limb, followed by slow installation and progressively of a light rigid-acinétic syndrome that after 2 years of evolution was already bilateral. Begin treatment with dopaminérgic agonist (bromocriptine) and amantadine the first 2 years of the treatment, then started to treat with levodopa/carbidopa, with an adequate response, currently remaining in a stage 3 of the disease and UPDRSmotor=28. The older brother (OB) with 59 years old, of urban origin, begins also with blepharospasm at 54 years old followed by a tremoric syndrome of the right arm, with a slower evolution than his brother and a better response to the treatment with bromocriptine and amantadine (UPDRSmotor=14). Both brothers after initiated the treatment began with great improvement of blefarospasm and Parkinsonian symptoms. In both the neuropsychological examination showed cognitive deterioration with frontal lobe dysfunction (Montreal Cognitive Assessment: YB=16; OB=17, Fontal Assessment Battery: YB=10; OB=13), furthermore began with sleep disorders a year before the motor symptoms. We ordered studies in order to rule out Parkinson plus: ceruloplasmin in serum and urine were normal, liver study without alteration, neuro-ophthalmological study rule out the presence of Keyser-Fletcher´s rings, the MRI showed light cortical atrophy. Until now they have not appeared patient sick in the IV generation although these do not exceed still the 40 years old. Figure 1 Pedigrees of the brother family, showing the onset Parkinson’s disease in second generation. Black symbols - affected individuals; white symbols - unaffected individuals. Anheim M, Elbaz A, Lesage S, et al. Penetrance of Parkinson disease in glucocerebrosidase gene mutation carriers. Neurology. 2012;78(6):417–420. Autere JM, Moilanen JS, Myllyla VV, et al. Familial aggregation of Parkinson's disease in a Finnish population. J Neurol Neurosurg Psychiatry. 2000;69:107–109. Bonifati V, Fabrizio E, Vanacore N, et al. Familial Parkinson's disease: a clinical genetic analysis. Can J Neurol Sci. 1995;22(4):272–279. De MG, Filla A, Marconi R, et al. A genetic study of Parkinson's disease. J Neural Transm Suppl. 1995;45:21–25. Kidron D, Melamed E. Forms of dystonia in patients with Parkinson's disease. Neurology. 1987;37:1009–1011. Klein C, Westenberger A. Genetics of Parkinson's disease. Cold Spring Harb Perspect Med. 2012;2(1):a008888. Lu CS, Lai SC, Wu RM, et al. PLA2G6 mutations in PARK14-linked young-onset parkinsonism and sporadic Parkinson's disease. Am J Med Genet B Neuropsychiatr Genet. 2012;159B(2):183–191. Paul KC, Schulz J, Bronstein JM, et al. Association of Polygenic Risk Score with Cognitive Decline and Motor Progression in Parkinson Disease. JAMA Neurol. 2018;75(3):360–366. Thomas B, Beal MF. Parkinson's disease. Hum Mol Genet. 2007;16 Spec No. 2:R183–R194. Wickremaratchi MM, Knipe MD, Sastry BS, et al. The motor phenotype of Parkinson's disease in relation to age at onset. Mov Disord. 2011;26(3):457–463. Yoshino H, Tomiyama H, Tachibana N, et al. Phenotypic spectrum of patients with PLA2G6 mutation and PARK14-linked parkinsonism. Neurology. 2010;75(15):1356–1361. Zaremba J. Rapid-onset dystonia-parkinsonism. Neurology. 2005;62(12):1296–1297. ©2018 Argüelles et al. This is an open access article distributed under the terms of the Creative Commons Attribution License , which permits unrestricted use, distribution, and build upon your work non-commercially.